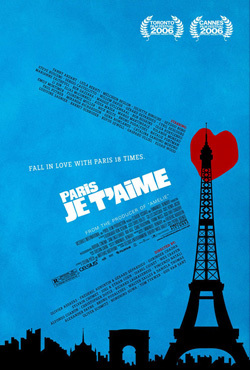 Paris, je t'aime is about the plurality of cinema in one mythic location: Paris, the City of Love. Twenty filmmakers have five minutes each; the audience must weave a single narrative out of twenty moments. The 20 moments are fused by transitional interstitial sequences and also via the introduction and epilogue. Each transition begins with the last shot of the previous film and ends with the first shot of the following film, extending the enchantment and the emotion of the previous segment, preparing the audience for a surprise, and providing a cohesive atmosphere. There's a reappearing mysterious character who is a witness to the Parisian life. A common theme of Paris and love fuses all.